The person of Christ’s mother has dominated Christian thought since the earliest of times despite our knowing so little about her directly. She has been made to personify so many of the Christian virtues: purity, selfless love, a model for perfect motherhood. Visions of Mary and stories of her interaction with the faithful are very numerous over the centuries leading to her cult being strong especially in the Roman church and her being the inspiration for some of the greatest works of art from the middle ages up to the present time. The central work in our programme is the ten part Stabat Mater by Domenico Scarlatti who lived and worked in Madrid from 1728 until his death in 1757. The poem, dating from the 13th century, is thought to be by the Franciscan friar Jacopone da Todi and describes Mary’s suffering as she stands at the foot of the cross. Scarlatti divides the poem into ten sections each describing different aspects of the meaning of the cross, its significance for humanity and Mary as intercessor and inspiration. The poem Salve Regina (Hail Holy Queen) dates from the middle ages and has been set many times by composers up to the present day. Victoria himself set it at least three times and this composition dates from about 1576. 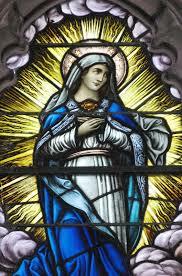 All the traditional poems in honour of Mary have numerous plainsong tunes associated with them. Monteverdi’s setting of the words Ave Maris Stella (Hail Star of the Sea), found in his Vespers of 1610, takes the plainsong melody and gives it a variety of contrasting arrangements in each verse. Our collection of more modern Marian music starts with Bruckner’s famous setting of Ave Maria. Pierre Villette’s Hymne A La Vierge dates from 1954 and Britten’s Hymn to the Virgin from 1935. The new generation of composers is represented by the L0ndon based Welsh composer Gareth Treseder who sets the traditional English medieval poem ‘Blessed be that Maid Marie’ . This focusses on Mary’s pivotal rôle in the Christmas story.